The currently available structural information is insufficient for a detailed analysis of interactions between human glycyl-tRNA synthetase (GARS) and enterovirus IRESs. At the same time, this information is required in order to understand how this IRES trans-acting factor (ITAF) functions during viral mRNA translation, which is in turn crucial for the development of direct-action antiviral agents. In this paper, a theoretical model of the complex between a cadicivirus A IRES fragment and the anticodon-binding domain of human GARS is constructed using molecular dynamics simulation based on all of the available structural and biochemical data. The proposed model enables the structural interpretation of the previously obtained biochemical data. Original Russian Text © O.S. Nikonov, M.S. Nemchinova, V.G. Klyashtornii, E.Yu. Nikonova, M.B. 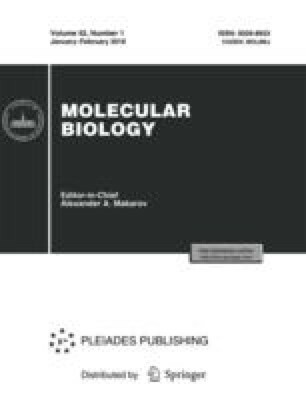 Garber, 2018, published in Molekulyarnaya Biologiya, 2018, Vol. 52, No. 1, pp. 112–119.